Take measurements of all the parts around the transom; fiberglass thickness of outside skin, plywood thickness, inside transom skin thickness, stringer location, stringer thickness, etc... You will want these measurements as a reference later. Before removing anything structural you must have the hull properly supported. 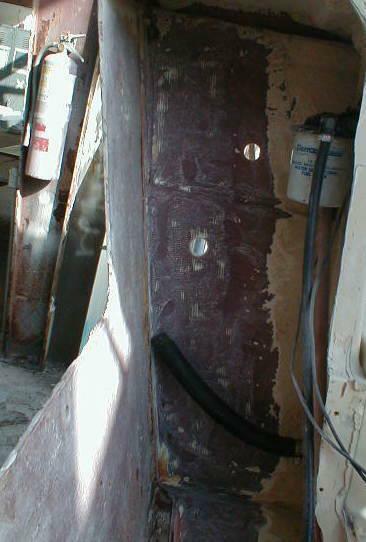 Removing stringers and/or a transom with out properly supporting the hull can result in a deformed or "oil canned" hull. The best support is a bunk trailer with additional blocks under the keel and transom. The next step is to gain access to the transom so you can remove the rot. Each boat will be a little different, sometimes you will have to cut the deck, the top cap, side walls or all the above, removal of cap is sometimes necessary in order to reach the entire inside of the transom. The next step in the removal of the old plywood core and inside fiberglass transom skin. You will need access to the entire transom plus at least 12" up the side and bottom of the boat. If you post pictures at our forum we can advise you on the best places to make these cuts to avoid time consuming fairing work (hiding seams). You must completely remove the old plywood core. A reciprocating saw, grinder, hammer and chisel, flat prybar are good to have. If you have an air compressor, a small air hammer with a wide flat blade is a good investment. Be careful to not inflict damage to the outside fiberglass skin. Once the old plywood and putty are removed, make a template of the transom using cardboard, doorskin or cheap plywood. You will use this template to cut your transom core and also to draw/cut the wide fiberglass pieces that will go between the new plywood and outer skin. your new plywood core should be the same total thickness as the original plywood. If you are changing anything about the design of the transom (higher engine mounts, enclosed transom, bracket, etc...) you may need to make adjustments to the thickness of the core. Post details on the forum and we can help with this. Most powerboat transoms are made by laminating multiple layers of 1/2", 5/8" or 3/4" plywood. The new core can be either made in one piece, then bonded into the hull, or you may laminate one layer at a time into the hull. It is generally easier to laminate the core outside the boat and bond it into the hull once, but on very large transoms this may not be possible due to weight and difficultly in handling. To laminate two pieces of plywood, first coat the faces of the plywood that will be glued together with un-thickened epoxy resin. This is a thin coat of epoxy, just enough to let the face of the wood soak up a little epoxy. While this epoxy is still tacky, mix a batch of epoxy glue. Using a notched spreader, apply even amounts of epoxy glue to each plywood face. The gaps between your new core and the sides/bottom of the hull will need to be filled with putty. After filling the gap, using the same putty, you will make a fillet all around the joint between the core and the hull. A fillet is a radius of putty that allows fiberglass to make a turn around an angle. Fiberglass and 90 degrees do not fare well together. All inside corners of transom should have a round fillet. The next step is the tabbing of the transom core to the sides and bottom of the hull. For tabbing, use 1708 Biaxial fiberglass tape. This tape is stronger than traditional woven tape due in part to its fiber orientation (45/45 degrees). It is also very easy to work with, wets out easily, and is epoxy compatible.